It's hard to believe that it's almost here- I leave for Paris in TWENTY days! 20!! I did a closet clean-out earlier this week and have been shopping with Paris in mind; my plan is to pack neutrals and light layering pieces. The weather will be a little cooler than in Dallas, so I have to resist the urge to pack all of my summer vacation clothes, and instead, think about cool spring staples that can be layered or worn alone on warmer days. 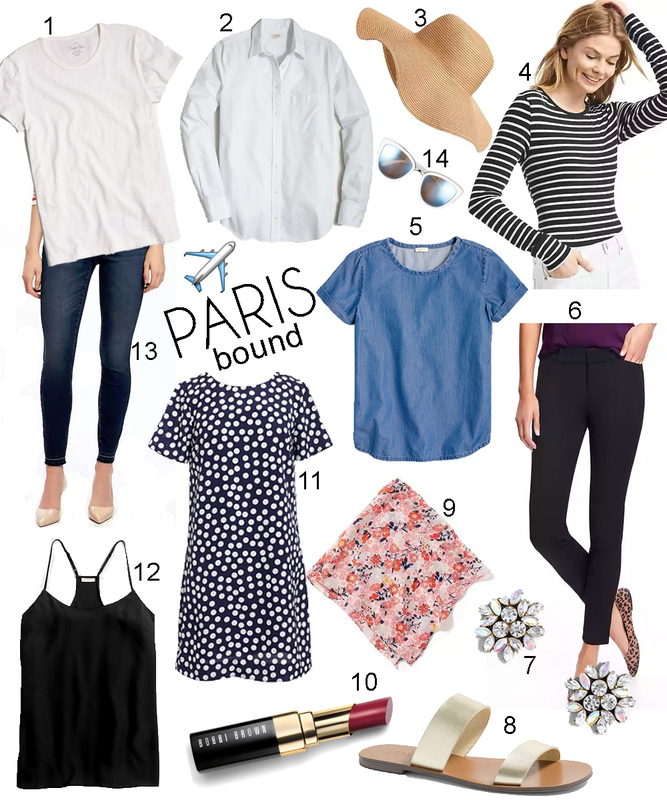 I've purchased all of the items below and have already been wearing them in Dallas, so I'm excited to mix and match them to create new outfits in Paris as I document my month in one of my favorite cities in the world! These pieces are so versatile and the best part: they're super affordable. Updating your wardrobe doesn't need to break the bank; all of these pieces came from Old Navy, Gap, and J.Crew, which are my top stores for easy staples without a hefty price tag. Bonus: some of these items are on sale right now! 1. Classic white tee that goes with everything and is so easy to layer! 2. White chambray button down can be worn on top or underneath. 3. Floppy hat just because it's cute. 4. Gap long sleeve tee (softest ever): black with white stripes, white with black stripes. I am so excited to layer these! 5. Chambray tee is the perfect fit and can be tucked in too! 6. Perfect pixie pant has great stretch to them and the ankle length works for flats or heels. 7. Crystal firework earring, my new favorite studs. 8. Gold slide sandals: from J.Crew, from Old Navy. These are going to be my go-to spring sandal. 9. Floral neckerchief, I've been wearing with everything and feel so French! 10. Nourishing Lip Color in Coral Pop, a lipstick but feels like a balm! 11. Polka dot dress, the perfect shift for running around town or dressing up! 12. Racerback silk cami, going to layer this under all of my cardis. 13. Frayed hem ankle jeans, so stretchy and soft, perfect for the airplane. 14. Cat eye sunglasses, the perfect fresh spring accessory!